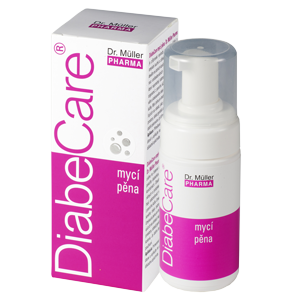 The primary cause of diabetes is the disorder of glucose metabolism which, among other things, due to an aggravated supply of cells with glucose, can conduce to malfunctions of the skin. The skin is dry, itches often and its nutrition is worse. Legs are the most frequently affected parts of the body, however the symptoms are not only restricted to those areas. 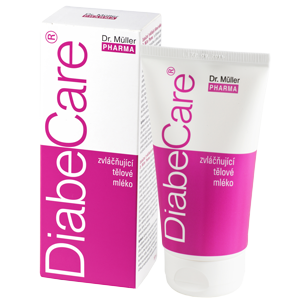 DiabeCare® softening body milk by Dr. Müller Pharma is specially designed for dry and sensitive skin of diabetics. It is also effective for cracked skin. The milk spreads easily, softening the skin. It contains a combination of carefully chosen active ingredients (macadamia nut oil, glycerine, urea, vitamin E, and bees wax). The wash foam is also convenient for hygiene of body parts which tend to get overheated like the inguinal, interdigital and genital areas. This foam is well tolerated even during long-term application. 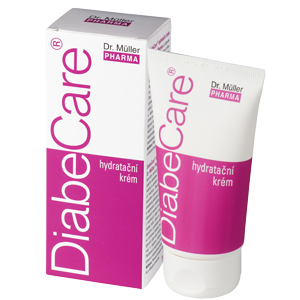 DiabeCare® hydration cream by Dr. Müller Pharma is a preparation specially developed for dry and sensitive skin of diabetics. It absorbs easily, and after application does not leave any trace of oiliness or grease. The cream is a combination of carefully chosen active ingredients (macadamia oil, panthenol, vitamin E, urea, and Aloe Vera). 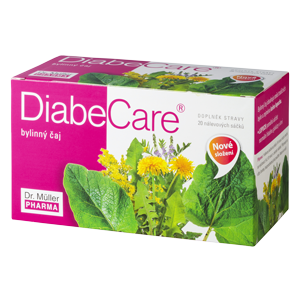 DiabeCare® tea contains a herbal blend used by traditional folk medicine. Pour 1/4 L of boiling water over 1 tea bag and allow it infuse for 5-10 minutes in a covered vessel. Do not boil. The tea shall always be prepared fresh. Drink it lukewarm. 1 tea bag once daily. Do not exceed the recommended doses. The product does not substitute varied diet. Not suitable for pregnant women and breast-feeding women. The product is not intended for children. Keep out of the sight and reach of children. The content of nutrients and energetic value of 1 tea bag are negligible.